I almost have enough money to buy you... just a few weeks away and you will be mine. Life without you is becoming increasingly unbearable. I used to think we could get along fine without you, but your cousin is getting on in years and isn't as fast as he used to be. It sometimes takes more than 30 seconds to load a page, which is just unacceptable. Not to mention, he doesn't seem to get along well with my new friend, Rebel xti. It was ok at first, but now it's affecting this blog. I'm so boring. And I don't play with Rebel very much because he and your cousin are not compatible. I want to play with Rebel. And there are projects piling up that your cousin just can't handle. Your cousin has been good to us, but I am looking forward to your arrival. I think the Nairn will appreciate you as well although he's not really allowed to play with you. Your presence will mean my husband can do work at home, which is good for all of us. It won't be long now. See you soon. Oh....I SO want that Mac Pro...so badly. 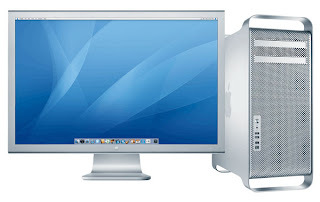 We have been discussing the possibilities of the MacPro in our home as well. Especially since my lousy and very old compaq has been crashing on a daily basis and I have officially stolen Josh's tiny Mac for my own personal use. But can I just live through you for the next few months since you're having a baby AND purchasing a new fancy Mac? That works. Okay. It's called a credit card. Why haven't you already bought it? Just kidding. Just read an article about American credit card debt and then felt so proud of you as I read about you waiting to own something that will really improve your life. Glad to know prudence still exists. We dated, got married and had some kids... all in NYC. It's fun. It's crazy. It's hard. But we love the adventure.